Enabling real-time collaboration to connect global employees and virtual teams is a growing trend among organizations seeking a competitive advantage. Worldwide, a large number of businesses and government agencies rely on Cisco WebExT software-as-a-service (SaaS) solutions to streamline business processes for sales, marketing, training, project management, and support. 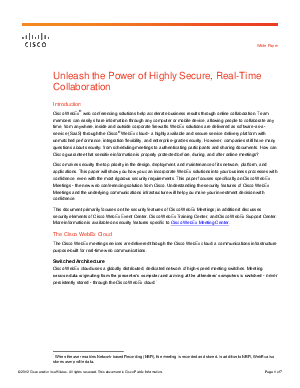 Cisco® makes security the top priority in the design, deployment, and maintenance of its network, platform, and applications. You can incorporate WebEx® solutions into your ongoing business processes--instantly, and with confidence--even in environments with the most rigorous security requirements.